You will receive an email with the link to download the requested document. Arteco Events Analytics (AEA) is the solution that improves, simplifies and enhances the management of the events generated by every Arteco system and the configured devices. A unique and innovative web-based platform, AEA supports the user in the diagnosis of the health of their overall security solution by reporting on the alarm events as well as the management of processes and operator duties. Thanks to the intuitive graphic interface of Arteco Events Analytics, each user has the ability to view, create and export information into many kinds of easy-to-understand graphs. Dashboard: the “home page” of Arteco Events Analytics, it consists of two different pre-configured charts which give the user an immediate representation of all the events that occurred in the last 7 days. System Diagnostics: through the many types of reports available, the user has the ability to monitor, analyse and compare the health status of the connected systems, for fast and effective diagnosis. Device Reports: a responsive and efficient reporting environment that provides the ability to analyse and compare all the events generated by any installed device. Operation Ranking: provides useful information for the optimization of the operations and the coordination of operators to help improve management of procedures and human resources. 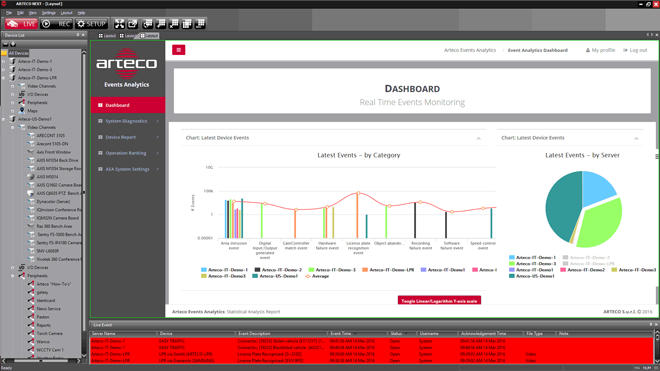 Arteco Events Analytics is a powerful and flexible solution that can help make better sense of the real-time information be generated by all security installations. From the single site installed in a challenging environment scaled up to enterprise installations with thousands of devices spread over hundreds of servers, the AEA organizes event information into easy-to-understand reports. Designed as a web-based application, Arteco Events Analytics can be used directly inside Arteco NEXT or on any tablet or smartphone to provide maximum usability and convenience from anywhere. Arteco Events Analytics: Available from today on Arteco NEXT eMotion, Active and Extreme.